Open to all members, especially those who may be looking to join a pack. Posting order to be determined as each person posts. Time was of the essence, as always. She had been here long enough, met with one or two loners who called this place home. Now the female needed to put some plans into action. The first starting with either accepting or turning away prospective members from a pack that she was starting. It was now or never. Build the pack starting from the ground up. Wolf Mortum had vanished, not that she was complaining. He was giving her time to think and she believed him to be taking care of his own troubles. The male had proven himself time and time again in her book. Whether or not he would show up today it was up to him. Last they spoke she was instructed to figure out what she wanted, what she needed. The time to mourn and regret was over and the iridescent pelted woman knew that. It was now time to regrow, become much stronger than anyone would have anticipated. It all began with a name. Rapacity. To destroy, to wreak havoc. Whether her members took this literally or not was not her concern. What she wanted them to do was to prove themselves to be above the normal lackadaisical ways of some packs. Just don't mess up. The female moved fluidly down the mountain peaks and to the fields. Placing her scent along the terrain that she had decided would encompass the new territory. There were no other packs around here, just loners. That meant she would have one hell of a time creating one of her own. Nimble paws carried her over the land that changed from harsh black rocks to dirt and grass. Summer was in these lands and the wildlife was flourishing. She had chosen to travel down to the fields later in the day to avoid any unwanted interactions with the felines that called this place home before she did. That was going to change as well. 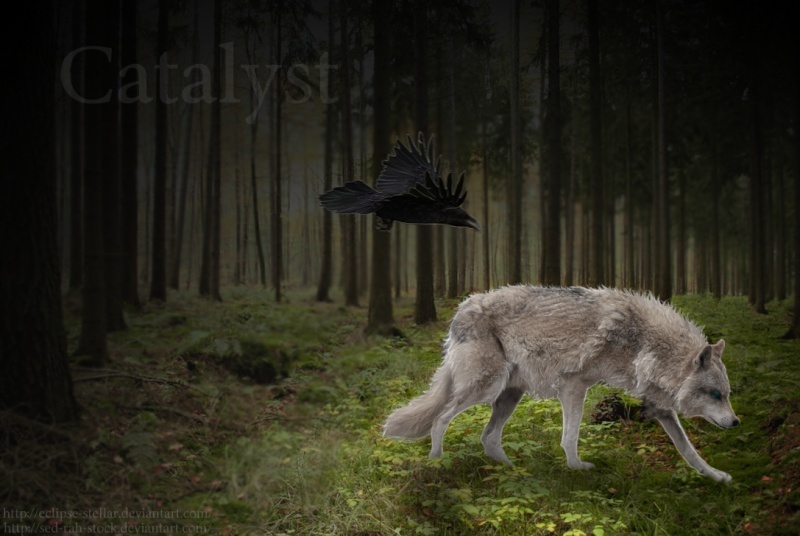 Wolves would rule this land and these wild cats would fear a new predator around. Art by LadyTrupp@DA/Code by Eclipse- Do not use without permission! A new scent? He had been staying up in the perilous heights of the mountains, making his home there since he had been accustomed to harsh conditions. Such things made him who he was. Today however, he was out in search of food, having descended the mountain to the fields and forests below having grown weary of mountain goat and the wild cats that continuously attempted to claim his kills as their own. Deer was his prey for today and it would seem there were plenty to choose from. This new scent caused Fangir to lift his muzzle from the ground, having been on the trail of a buck that was decent sized, noze twitching slightly as he tests the air, ears standing on the top of his head. His curiosity piqued he sets off, following this scent as best he could, the grey tinged male moving easily in spite of his size, though he wasn't moving with any sense of urgency but a a light jog. It wasn't long before he found himself back in the fields, eyes looking around the area as he slows to a stop along the wood line. Amber orbs finally come to rest on the black furred wolfess who moved quickly across the land. He comes to a stop, just outside the line of trees and into plain sight.